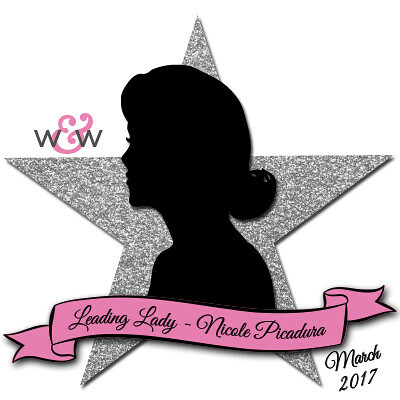 Today is the first Saturday of March which means the debut of our March Leading Lady, Nicole Picadura! Nicole is a complete and utter sweetheart and very gifted. She works for Altenew as part of their leadership team as well as starting to a couple of design stamp sets for them very recently! Originally from South Korea, she now lives in sunny California with her husband and furry babies. With her clean and simple aesthetic taking on different techniques and a love for teaching (she taught a couple of classes in the past featuring our releases back in 2015), I think this going to be a very inspiring month for us all. Please give Nicole a big round of applause to welcome her as she steps onto the stage for her first performance as our March Leading Lady! Happy Saturday! Every Saturday throughout this month, I will be sharing projects using some brand-new and some well loved older products from Winnie & Walter. We will play with various mediums so you can get more out of your W&W stash! Multifaceted stamps and cutaways from W&W have always been my favorites. It can add so much texture and interest without using a lot of supplies. Today's card uses the True Multifaceted Heart Cutaways as a focal point, along with some sentiment stamps. To create this focal point, I ran the die through the die cut machine using some white cardstocks. There are 2 die cut pieces, so you are going to layer the detailed cut piece on top of the solid piece to create a template. I used a texture paste and a coral/pink ink pad to dress up the heart. Start with the white texture paste to go over the bottom portion of the heart with a craft knife. After that, mix the white texture paste with the coral ink pad to add some color! Simply run the colored paste over the top portion of the heart, that way you will get this ombre of coral/pink/white shade. After adding the paste, carefully lift the detailed die cut piece from the heart and let the embossed piece dry for a couple of hours. For the card background, I combined various stamps to create a gray shade gradient. The stamp sets I used are The Big, the Bold, and the Happy stamp set, Sending You with Evelin T Designs stamp set, and the Sentimental: Love stamp set. I started with a dark gray ink pad and went on to a light gray ink pad and stamped from the top to bottom of the card base. As a finishing touch, I added a shimmer onto the heart so add some shine to the focal point. There are various ways to add colors, and using a die with embossing paste and inks can be a fun way to bring both texture and color yo your projects! Wow..Such a soft n Dreamy look ! This is so lovely!!! I like the graphic lines with the soft colors!! Gorgeous card! Love the Heart Cutaways die! Awesome look for the background! Thank you, Denise! I can never have enough of these Heart Cutaways!! This is really beautiful Nicole. A great card! Great design & beautiful card! Looking forward to all your Leading Lady posts! Love these, and love the sentimental stamps! so pretty with the shimmer and texture. What a creative way to add subtle color and texture...just beautiful! So glad you like it, Karen! Love the soft colors and the use of texture paste!! Wow!!!! Adorable card!!! Welcome Nicole!! !